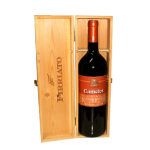 Full and complex bouquet that opens with extremely fine fruity scents of blueberries, raspberries and wild strawberries that make way to delicious hints of cherries and black cherry jam, cinnamon, cocoa, eucalyptus, mint and herbs of the Mediterranean maquis. Mouthfilling and soft, with great taste profile, thanks to marvelous and intact fruit, masterfully balanced with the lively fresh and dynamic acidity and lavish and refined tannins. For some time it has become a "cult" wine; an extraordinary Sicilian interpretation of the famous Bordeaux blend; rich, juicy, exciting, trepidant, compelling and noble like the marvelous and timeless legend it takes inspiration from. To be tasted with rigatoni and hare ragout, tortelloni with overcooked veal, lamb loin with herbs, braised beef cooked with this wine, a delicious grilled steak of Chianina beef, stewed pork with onions. It is perfect with aged and firm-bodied cheese and it matches well with any specialty whose ingredients include chocolate.